Since the 12th century, Braga is considered to be Portugal’s religious capital. Years of Christian influence have shaped this Portuguese Rome into an interesting mixture of ancient and modern, infused with baroque charm. You will be swept away by the city’s imposing architectural style and numerous mansions, many of them housing excellent museums that will enhance your exploration. Enter the oldest cathedral in the country, Braga’s Cathedral from 12th century, built by D.Henrique and D.Teresa, the parents of Portugal’s first King, and admire many stunning historical buildings like the Theatro Circo or Palacio do Raio. Discover the Museum of Sacred Arts, housed in the cathedral’s Treasury and then enter the pedestrian zone of the city via Arch of the New Gate, masterpiece of Baroque and Neoclassical style. Leave some time for tasting famous sweet Portuguese wine at the busy Avenida central, as well. In the end, experience the beauty of the most impressive religious sanctuary in Portugal, Bom Jesus do Monte lying on the western slopes of Monte Espinho. 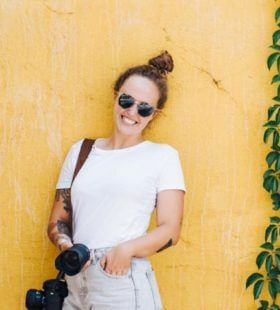 Let your personal photographer in Braga take photos of you standing next to the monumental granite staircase interconnected by a series of chapels, connecting the entrance portico with the hilltop church.